﻿ Hotel Colors Rome. JIMAT di Agoda.com! Ada soalan mengenai Hotel Colors? Menawarkan penginapan yang berkualiti tinggi di daerah minat agama, budaya, siar-siar di Rome, Hotel Colors merupakan pilihan popular untuk kedua-dua tujuan perniagaan dan percutian. Dengan lokasi hanya 0.5 km dari pusat bandar dan 35 km dari lapangan terbang, penginapan 2-bintang ini menarik banyak pelancong pada setiap tahun. Persekitaran yang terjaga dan kedudukan berhampiran dengan Kedutaan Honduras, andrea925 Handmade Jewelry, Coin Excelsior membuatkan penginapan ini menjadi tarikan. 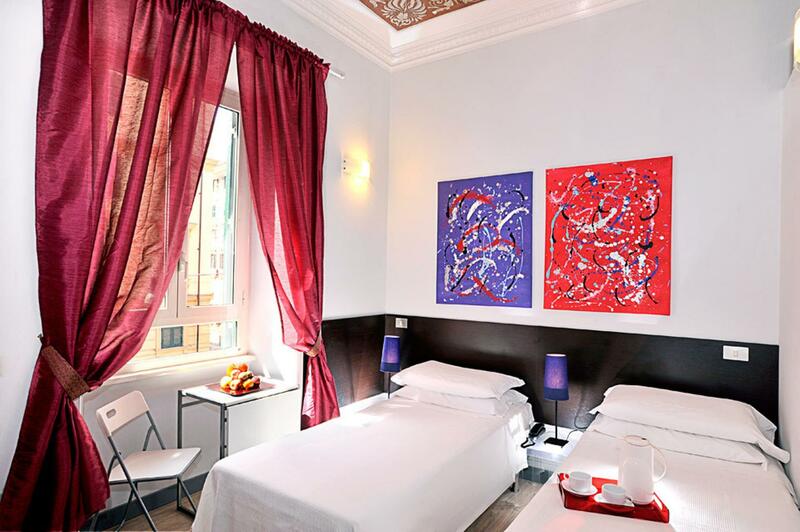 Hotel Colors juga menawarkan banyak kemudahan untuk memperkayakan penginapan anda di Rome. Hotel ini menyediakan akses kepada pelbagai perkhidmatan yang luas, termasuklah Wi-Fi percuma semua bilik, meja depan 24 jam, daftar masuk/daftar keluar ekspres, simpanan bagasi, Wi-Fi di tempat awam. Alami bilik dengan kemudahan berkualiti tinggi sepanjang anda menginap di sini. Sebahagian bilik menyediakan televisyen skrin rata, linen, tuala, almari, ruang tamu asing untuk memudahkan tetamu berehat dan kembali bertenaga. Di samping itu, pihak hotel menawarkan aktiviti rekreasi untuk memastikan anda mempunyai perkara untuk dilakukan sepanjang penginapan anda. Apabila anda mencari penginapan yang selesa dan mudah di Rome, ijadikan Hotel Colors sebagai rumah anda seperti berada di rumah sebenar. Sarapan tidak termasuk dalam harga bilik. Oleh kerana peraturan cukai, semua tetamu harus membayar surcaj cukai bandar yang tidak termasuk dalam kos tempahan dan akan dikutip oleh pihak penginapan semasa mendaftar masuk. Kanak-kanak di bawah 10 tahun dikecualikan daripada cukai surcaj bandar. 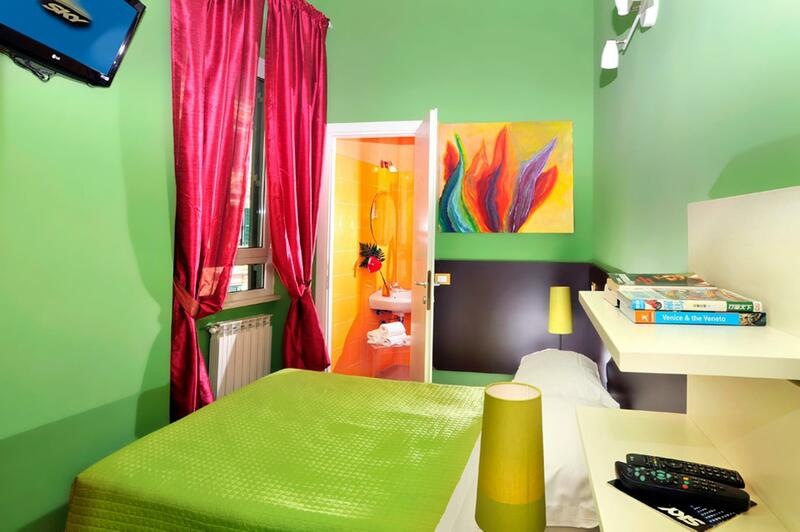 Hotel Colors is a good, clean, inexpensive hotel within walking distance of many of Rome's amazing attractions. One needs to be able to climb stairs, though, because there's no elevator. Difficult for older people or for carrying luggage. Pros: walking distance from Vatican and tourist spots, restaurants nearby, very accomodating staff, near bus stop for Roma Fiumicino Airport. Cons: a bit of a walk from the underground station We stayed in a small double bedroom with shared toilet but has own shower in room. Facilities are good and clean. We did not have any problems with going and using the toilet as we shared with just one other room but just realized it’s still more comfortable to have one in the room rather than outside. Hair dryer in room but was taken off from us the next day and they don’t have any spares at that time. They let us use the one they have in their other shared bathroom which was 2 floors from where we stayed. All fine but having a permanent one in the room should’ve been better. We stayed at Hotel Colors as our usual Rome accommodation was fully booked. It was a good price, and OK location. Room was clean and bathroom good. The air conditioning was only just OK though - if you ran it all day you could get the room down to 24 degrees which was OK for sleeping but a little cooler in the afternoon would have been good. However whenever we went out the cleaners would leave the windows open (with the ac on??) and then we would have to start all over again with trying to cool the room. I liked this 2 star hotel better than I liked the 4 star hotel we stayed in at the beginning of our holiday. They replenished our water everyday not just the first. They made sure we had clean bedding, towels and had replenished everything. 5 stars to Housekeeping. The receptionists were all lovely and polite. I wasn’t massively keen on the stairs after walking around Rome all day nor that there was no kettle for tea, but I am British. I would stay here again regardless of that. Very pleased. the staff knew their stuff, gave us a good briefing, and rooms were kept clean and beautiful. easy to find location. Great! Very handy, near to Vatican. I suppose the traffic noise is somewhat inevitable as a trade off with the location but you should consider that before booking. We also had the room next to reception, which meant extra noise. The decor is in keeping with the hotel name. Looked recently redone - door still had another hotel name on it. Oddly although the room had a shower and a sink, the loo was shared and at the far end of the corridor next to the breakfast room. Can't help thinking they could have planned that better. Hotel Colors is just beside Vatican, the best they can offer. The hotel floor is higher than the usual. The reception is two floors higher from the ground. Imagine seniors given a room at the fourth floor with no lift. Tiring, so seniors, "BEWARE". No elevator so u must bring ur own stuff to the 2nd/3rd floor , if u r a light traveler than ok but if your bring a heavy lagguage than its a big problem . Room ok , staff ok , location very great , wifi extremly bad , hot shower didnt work . The price at which we paid does not give justice to the rooms we stayed. The room was a double and it was very small that we could not even open our luggage. The bed was a little hard and uncomfortable. The toilet was flooded with water everytime we shower because the tub only has half of the cover. It was water everywhere. There was NO elevator and no help extended! Too pricey for this hotel. Good: 24 hour check in, luggage can be stored (although openly in the common area), and thry printed my biarding pass for free. The place is close to restaurants and supermarkets and a few blocks from the vatican. a big thank you to the tall deeped voiced man that told the room two doors down to shut up! i was trying to sleep for the vaticant tour very early next day! i was about to get up and complain but you heroicly came to my aid without you reasling it. Swiss guards have nothing on you :-) FURTHERMORE STAFF REALLY HELPFUL, HELP ME FOUND LANDMARKS, BOOK TAXIS, AND ANSWER SILLY QUESTIONS The bed is hard (but weridly comftable) My room (superior double "208"), is small but it came with a balcony which was great. The shower is powerful, and it has sky TV!!!! ( PLEASE NOTE YOU CAN CHANGE TO ENGLISH AUDIO IF YOU PRESS I ON THE REMOTE) close to supermarket, mcdonalds (for the hangover day), hop on hop off bus, vaticant WIFI GREAT, telly was in a werid position. really enjoyed my stay. CHEERS! 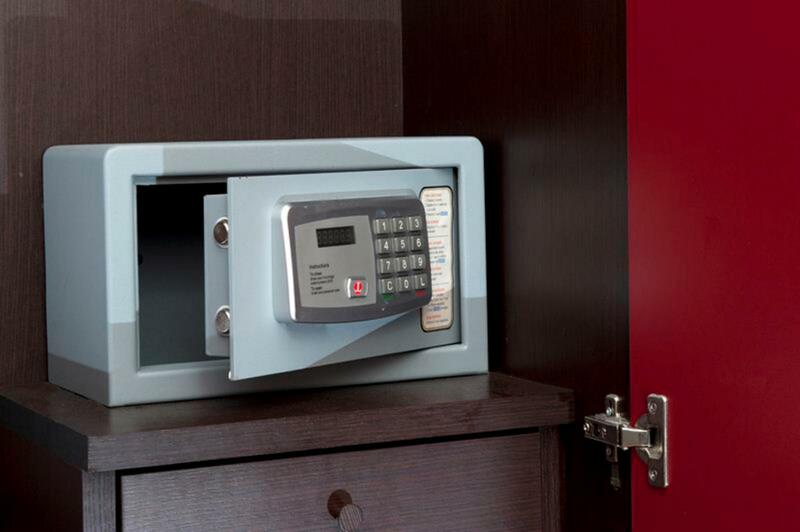 The hotel was located within walk-in distance from the most popular tourist attractions. It was clean and the kind and helpful staff made our stay excellent. I would definitely recommend this to anyone who does not want to spend hundreds of euros for their accommodation, but would also not like to stay in a hostel dorm. This hotel is located in a building, so every time you come, you will have to ring the bell to go inside. Rooms scatter on three floors, and we are on the third floor with no elevator, so it is quite hard for the little child. Location is very good, just around the corner is a convenience store opens till 10PM, and a Fish and chips restaurant (Porto) - which is very nice. Bed is so so, bathroom is ok but the hot water is not stable, it can suddenly go from hot to cold and then warm. Breakfast is nice. 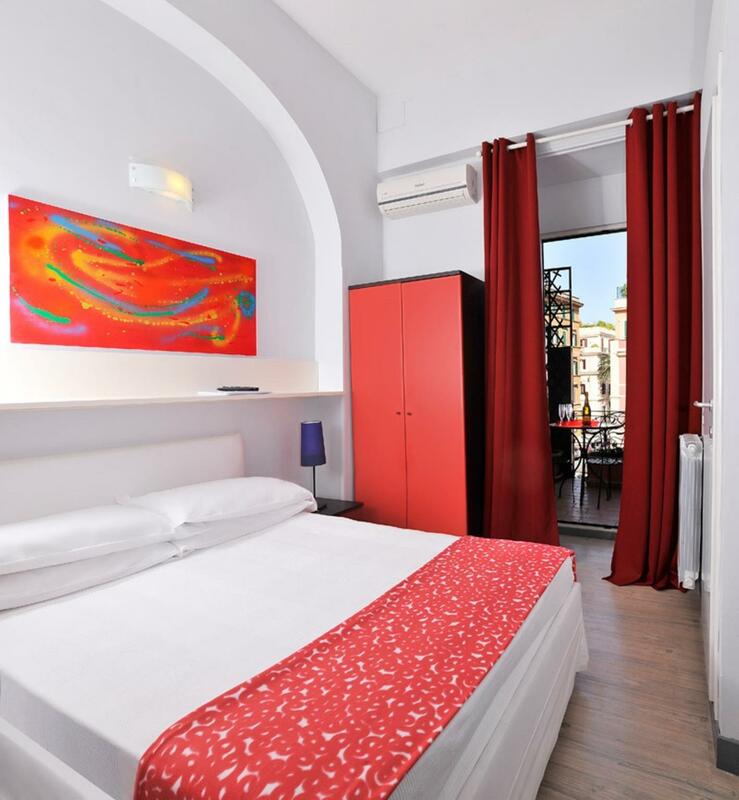 From the hotel you can literally go everywhere, 800m to Ottaviano Metro station, 300m to bus stop (81) that directly connect to Colosseum. St Peter's church is very near, you can go on foot to everywhere in Vatican. 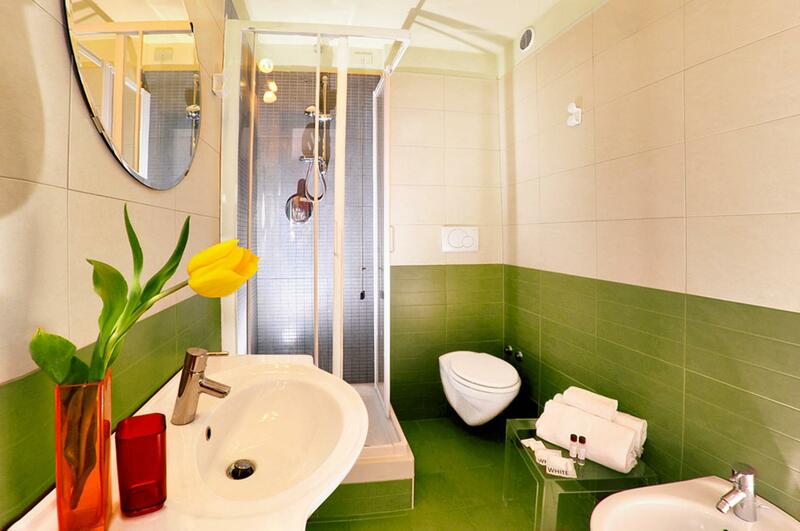 With this price, this hotel is very value for money, and convenient. Great stay. Easy walk to the main attractions. Our room was right next to the reception so we were woken early in the morning but didn't let that ruin our trip, you could just wear earplugs. Nice room and lovely staff. Would stay again if room was not by reception. 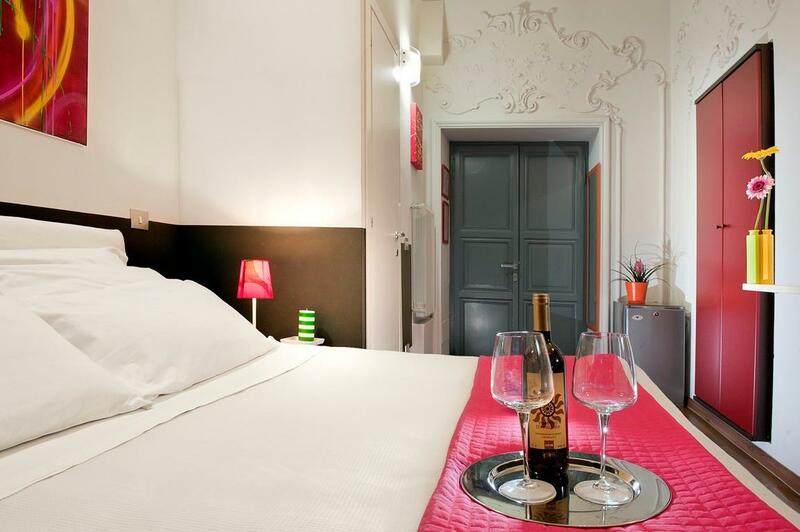 Hotel Colors is about 10 minutes from St Peter's and 15 minutes to Piazza Navona in the Historic Quarter. Housed in a 19th Century apartment block the rooms are on the ground floor (up a flight of steps) and the 2nd and 3rd floors with no lift so not advisable to anyone with mobility restrictions. 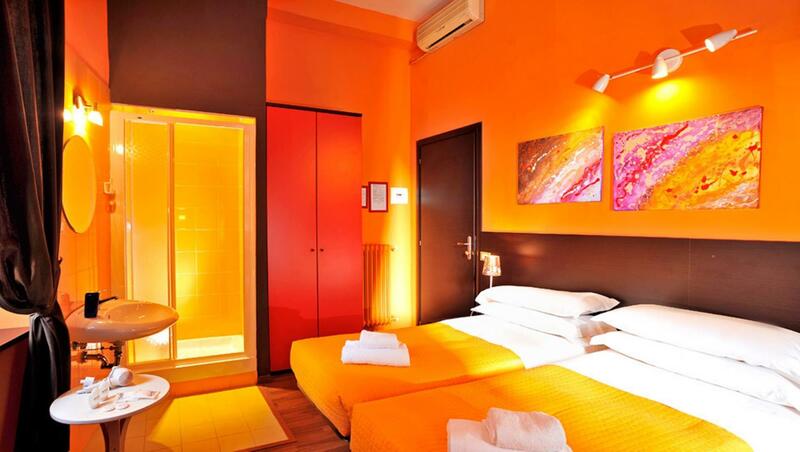 However the rooms are a nice size and bright & colourful. The hotel has a mix of en-suite rooms and rooms sharing a bathroom- we had an en-suite room which was basic but clean and functional. The rooms were cleaned and beds made daily. The staff were very helpful. Location, very helpful staff and comfortable rooms. 2 star hotel is a very modest way to describe Hotel Colors. 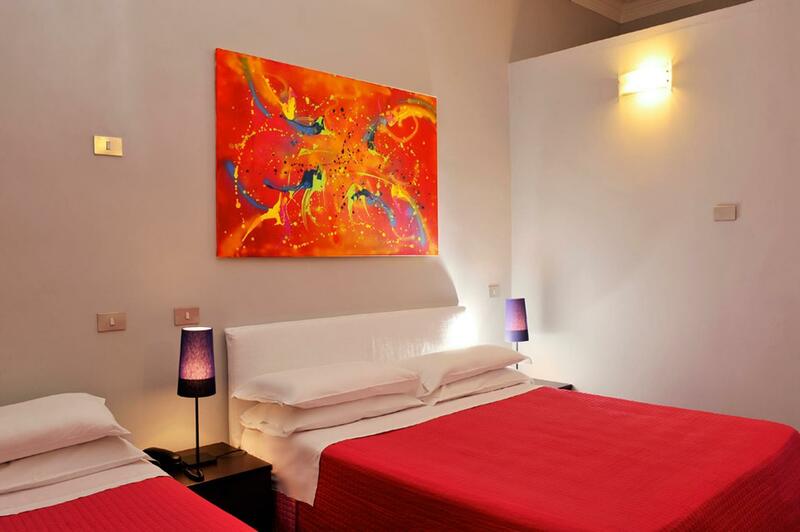 The rooms are very comfortable, it is in a great location (pretty much walking distance from all places). Just 5 - 10 minutes from the Vatican and Castel Santangelo. We couldn't fault how accomodating and helpful the desk staff were. Next time we travel to Rome, we would definitely stay again! Thank you Hotel Colors. Our stay in the hotel was really nice. We enjoyed Vatican, Rome tour and nice people around. The hotel is OK except that they should develop / construct an "elevator" for the guest with huge luggage / bags. The hotel was 30 min by shuttle bus from the Fiummicino airport and the bus stop was just 5 min walk. Since my main purpose was to have a pilgrimage at the Vatican, it was only 10 min walk from the hotel. The vicinity of the hotel is surrounded by restaurants, grocery store so ita was easy to get your meals and food. The lady at the reception was very pleasant and helpful,she even called my tour provider to pick me uo at the hotel. Everyday, the room was cleaned and new towels were provided. The breakfast was also great with unlimited amount as you can eat and it was self-service. I really enjoyed my stay, got good rest and sleep and always ready for the walking tour for the following day. I stayed for 4 nights and the price was very reasonable for the solo room I got. I will book with them again when I return.